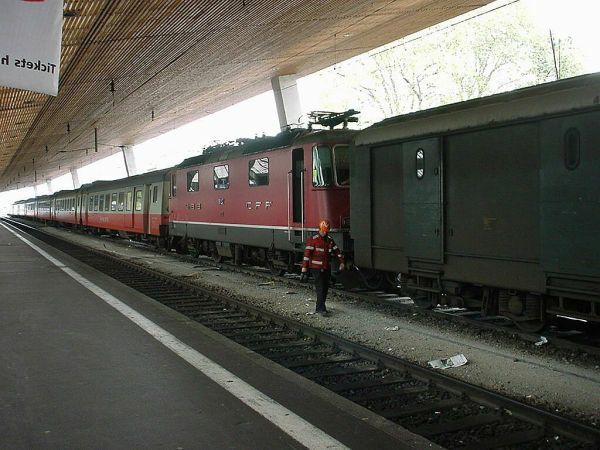 The "Swiss express" concept is from the 1970s when pull-push type of pendeling trains became popular in Europe. SBB built a series of light metal coaches called EW III (Einheitswagen III, standard coach III) which were used in fast express trains, for example on the important Zürich - Geneve route. They were intended to be fitted with active tilting, but that was never realised. The trains did not have to turn around at end stations, so traffic was fast. Note also the orange colouring: in the seventies it was an officially accepted trend that all public transport - trams, buses and trains - should all be coloured orange. 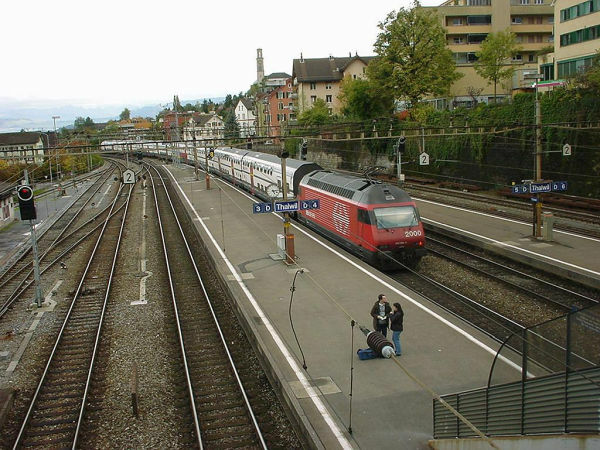 A typical Swiss Express train also had its locomotive in the middle when it left Zürich and it was broken into two typically in Bern. For this switching the coaches and locomotives were fitted with automatic Scharfenberg couplers. 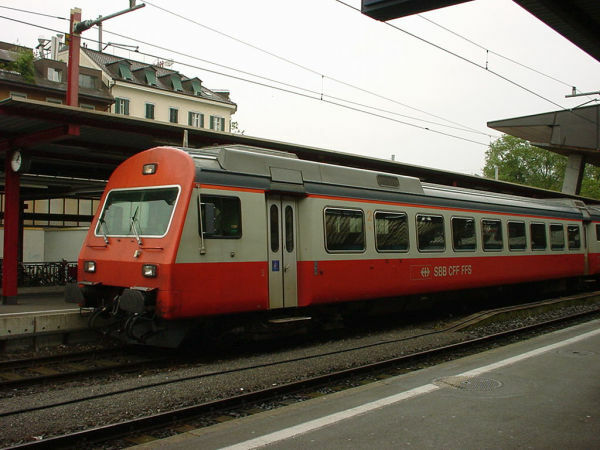 Today the Swiss express trains are still used, but SBB sold them to BLS Lötschbergbahn. Now in 2019 BLS is planning to scrap them. Picture from Zürich main station 9.6.2002 by Ilkka Siissalo. The steering wagon of a Swiss express concept train from the 1970s. The looks of the cockpit closely resemble the NPZ or Neue Pendelzug concept commuter trains´ front parts. 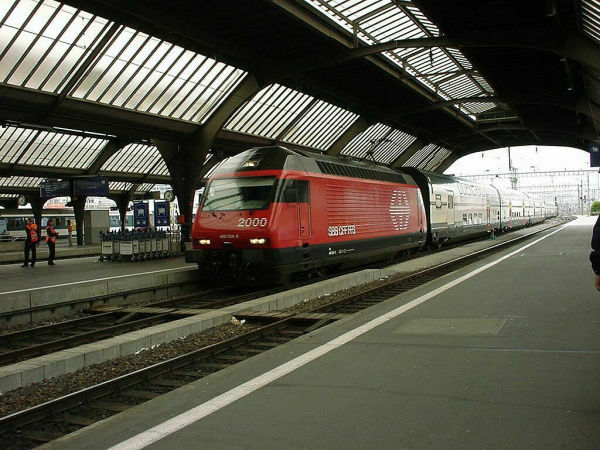 SBB´s "Bahn 2000" concept train arriving at Zürich main station. This is the late 1990s high value, high capacity concept train for IC (InterCity) and IR (InterRegio) express trains: a Lok 2000 concept locomotive (= Re 460) leading a train of typically 8 double decker coaches, the last one of which has a steering cockpit, built by Adtranz in the late 1990s. In the beginning of the new century this was the most often seen express train type in Switzerland on the most important lines. A typical IC "Bahn 2000" train leaving Thalwil. Note that when the Re 460 locomotive is pushing the train it´s using its aerial at the very end for the electricity. Also note the typical Swiss sign of end of train: only one red lamp at the last wagon (which this time is the locomotive).